Browse the world's largest collection of historical documents and memorabilia about annuities. Annuity Museum takes you back to the origins of annuities and exhibits their role in the development of financial markets and retirement planning. Features the use of annuities by the US government to purchase Native American lands during the 19th century. 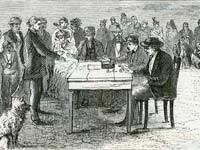 This article suggests that the exchange of lands for annuities was a one-sided transaction where Native Americans were deceived. Provides a brief history of the printing and distribution of Acts of Parliament. In so doing, it offers insight into the scarcity and value of some of the antique documents in the collection, which date from 1702 to 1880. Describes the formation of the Railroad Retirement Board, a body responsible for delivering retirement annuities to railroad workers and their families in the US during the 1930s and 1940s. Reviews the evolution of annuities. This article starts with the earliest annuities, in Roman times, and takes you up to their use in the Great Depression. Highlights the early use of direct mail advertising for annuities and insurance in 1840s England, with examples of rare Mulready lettersheets and envelopes. Presents a concise history of Bank of England annuities, a special type of government bond issued from the late 1600s through 1888 to finance wars, stipends for royalty, and major public projects.